Don’t throw out day-old bread when you can make the best whole wheat bread pudding recipe for dessert. It’s warm, custard-soaked goodness. Preheat oven to 325°F and grease an 8-by-8-inch glass baking dish well with butter. If bread it not day-old, you will need to dry it out. On a rimmed cookie sheet, spread fresh bread cubes in an even layer, then stick them in the preheated oven to bake for 8-10 minutes or until dry but not browned, tossing them halfway through. Meanwhile, in a medium bowl, whisk together the honey, eggs, egg yolk, and vanilla. In a heavy-bottomed medium saucepan, bring the milk, heavy cream, cinnamon, and nutmeg to a simmer over medium heat. Remove from heat immediately. Add 1/4 cup of the hot milk mixture to the egg mixture slowly, whisking as you pour it in. Repeat this process twice before adding the milk and egg mixture back to the hot milk mixture to temper it. Return to medium heat and cook until the custard mixture is thickened, about 5 minutes. 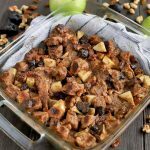 In a large bowl, combine the bread cubes, apple, walnuts, raisins, and figs. Pour the custard mixture over the top and toss to coat. Let stand for about 10 minutes, until the liquids have soaked into the bread throughout. Spread evenly into the prepared baking pan. Fill a 9-by-13-inch baking dish or a roasting pan ½-1 inch full with hot water. Place the filled baking dish inside, and cover it with foil. Bake for 40 minutes, until cooked through and edges are bubbling. Remove pan from water bath, remove foil, and return bread pudding to the oven to bake for 10 additional minutes, until the top is browned. Let cool slightly, then slice and serve warm.